Self-taught artist Scott “Toobz” Noel is well known in the Roanoke, Virginia, community for his immense murals at popular destinations across the Valley. His colorful and surreal work references his early fascination with graffiti art as well as his challenges from being color blind. The Taubman Museum of Art was delighted to commission the artist to create a one-of-a-kind mural highlighting his long-term fascination with horses and ancient cave paintings for the Museum’s outside patio wall and along the underpass on Norfolk Avenue. 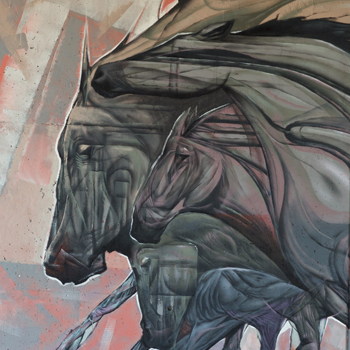 Noel’s mural presents an abstracted view of many galloping horses merged into one massive mythical horse charging around the Museum’s patio wall and alongside Norfolk Avenue. Spanning a distance of more than 125 feet wide and 14 feet in height, In It for the Long Run is Noel’s largest mural to date. Noel was raised in Lynchburg, Virginia, and was part of the skateboard scene for many years, traveling around the country before settling in Roanoke, Virginia. Noel’s work has appeared in several exhibitions, including ones at Fleda A. Ring Artworks in downtown Roanoke and at Art Rhino in Washington, D.C. His work also recently appeared in a solo exhibition titled “Lodged” at Glitch Gallery in Richmond, Virginia. His public murals can be found at locations around the Roanoke Valley, including at the Wasena Tap House and on the side of the Greenway Self Storage warehouse in Wasena. Noel's murals at the Waterheater Building on 5th and Elm and on the side of Cups in Grandin Village were created as part of RAMP (Roanoke Art Mural Project) founded by Mim Young. Scott “Toobz” Noel: In It for the Long Run is organized by the Taubman Museum of Art and curated by Amy G. Moorefield, Deputy Director of Exhibitions, Taubman Museum of Art.